Gif of a movie of the CME, taken by the Solar Dynamics Observatory’s Atmospheric Imaging Assembly at a wavelength of 304Å. The original movie can be found in [cited] the article. The Sun often exhibits outbursts, launching material from its surface in powerful releases of energy. Recent analysis of such an outburst — captured on video by several Sun-monitoring spacecraft — may help us understand the mechanisms that launch these eruptions. Solar jets are elongated, transient structures that are thought to regularly release magnetic energy from the Sun, contributing to coronal heating and solar wind acceleration. Coronal mass ejections (CMEs), on the other hand, are enormous blob-like explosions, violently ejecting energy and mass from the Sun at incredible speeds. But could these two types of events actually be related? According to a team of scientists at the University of Science and Technology of China, they may well be. The team, led by Jiajia Liu, has analyzed observations of a coronal jet that they believe prompted the launch of a powerful CME. An army of spacecraft was on hand to witness the event on 15 Jan 2013 — including the Solar Dynamics Observatory (SDO), the Solar and Heliospheric Observatory (SOHO), and the Solar Terrestrial Relations Observatory (STEREO). The instruments on board these observatories captured the drama on the northern limb of the Sun as, at 19:32 UT, a coronal jet formed. Just eight minutes later, a powerful CME was released from the same active region. The fact that the jet and CME occurred in the same place at roughly the same time suggests they’re related. But did the initial motions of the CME blob trigger the jet? Or did the jet trigger the CME? In a recently published study, Liu and collaborators analyzed the multi-wavelength observations of this event to find the heights and positions of the jet and CME. From this analysis, they determined that the coronal jet triggered the release of material to form the CME, which then erupted into space — with the jet at its core — at speeds of over 1000 km/s. Based on observed clues of the magnetic field configurations, the team has put together a theory for how this event unfolded. They believe that sudden magnetic reconnection in an active region accelerated plasma to form a large-scale coronal jet. This burst of energy also provided a push on a blob of gas, threaded with magnetic field lines, that lay above the jet. The blob then rose, and when the field lines broke, it was released as a CME with the jet at its core. Some had hoped comet ISON would be the comet of the century, lighting Earth’s skies during the latter months of 2013. Instead, it was barely visible for ground-based observers, but the Solar and Heliospheric Observatory (SOHO) had a ring-side seat to watch its disintegration. 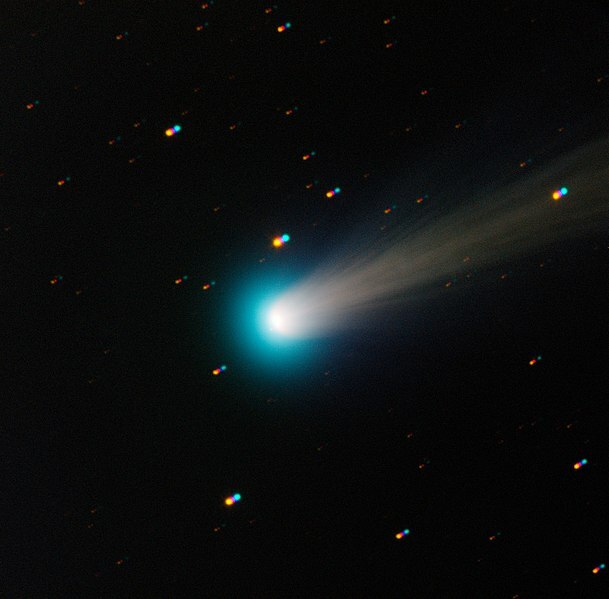 This new view of Comet C/2012 S1 (ISON) was taken with the TRAPPIST national telescope at ESO’s La Silla Observatory on the morning of Friday 15 November 2013. Comet ISON was first spotted in our skies in September 2012, and will make its closest approach to the Sun in late November 2013. TRAPPIST has been monitoring comet ISON since mid-October, using broad-band filters like those used in this image. It has also been using special narrow-band filters which isolate the emission of various gases, allowing astronomers to count how many molecules of each type are released by the comet. Comet ISON was fairly quiet until 1 November 2013, when a first outburst doubled the amount of gas emitted by the comet. On 13 November, just before this image was taken, a second giant outburst shook the comet, increasing its activity by a factor of ten. It is now bright enough to be seen with a good pair of binoculars from a dark site, in the morning skies towards the East. Over the past couple of nights, the comet has stabilised at its new level of activity. These outbursts were caused by the intense heat of the Sun reaching ice in the tiny nucleus of the comet as it zooms toward the Sun, causing the ice to sublimate and throwing large amounts of dust and gas into space. By the time ISON makes its closest approach to the Sun on 28 November (at only 1.2 million kilometres from its surface — just a little less than the diameter of the Sun! ), the heat will cause even more ice to sublimate. However, it could also break the whole nucleus down into small fragments, which would completely evaporate by the time the comet moves away from the Sun’s intense heat. If ISON survives its passage near the Sun, it could then become spectacularly bright in the morning sky. The image is a composite of four different 30-second exposures through blue, green, red, and near-infrared filters. As the comet moved in front of the background stars, these appear as multiple coloured dots. TRAPPIST (TRAnsiting Planets and PlanetesImals Small Telescope) is devoted to the study of planetary systems through two approaches: the detection and characterisation of planets located outside the Solar System (exoplanets), and the study of comets orbiting around the Sun. The 60-cm national telescope is operated from a control room in Liège, Belgium, 12 000 km away. This image is a montage spanning three days from 28–30 November 2013. The comet enters the image at the lower right, passes round the Sun and exits the frame towards the upper right. The bright star to the lower left is the red supergiant star Antares. 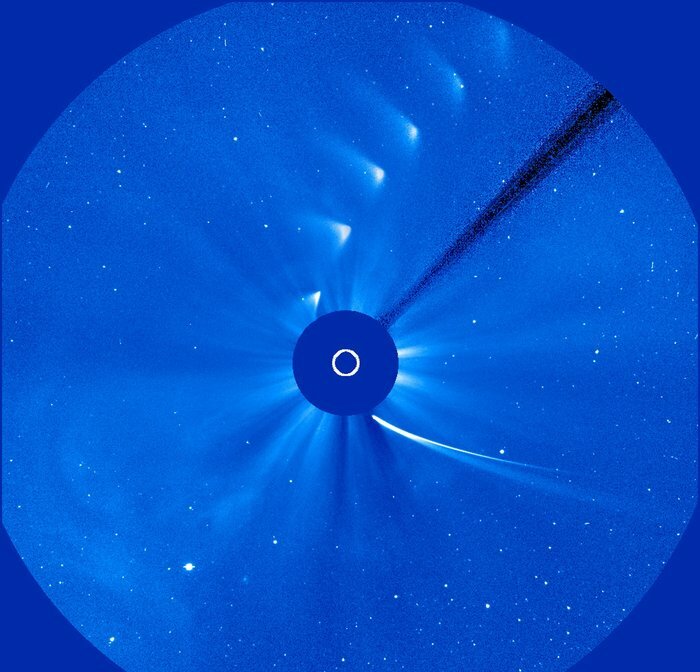 Astronomers had been tracking the comet for more than a year as it edged closer to the Sun, and by late November it had passed into the field of view of SOHO’s LASCO C3 camera. It was to skim the Sun, just 1 165 000 km above the fiery surface. This is approximately 50 times closer to the Sun than innermost planet Mercury, and the comet was officially termed a ‘sungrazer’. If it survived the encounter it was expected to become extremely bright and be a well-placed object, visible to the naked eye in Earth’s night sky. Calculations based on its orbit show that ISON began its journey towards the Sun about 3 million years ago, dislodged from its distant orbit by a passing star. Now, its fate would be sealed within days. On 27 November, the comet brightened dramatically by a factor of about ten. Yet just before it reached closest approach to the Sun, it began to fade. This was a strong indicator that the heart of the comet, the icy nucleus, had broken up. Many expected it would disperse completely but, at first, it looked as if they were wrong. Comet ISON appeared to survive the close approach, emerging on the other side of the Sun. Some still hoped for a bright display in the night skies. But they were to be disappointed. Quickly, the comet began to disappear. A recent analysis of SOHO data showed that the nucleus had indeed disintegrated just before closest approach to the Sun. Nothing appreciable was left of it, just a lot of dust and vapour. The disintegration of comet ISON provided scientists with an exceptional chance to see a comet inside and out. 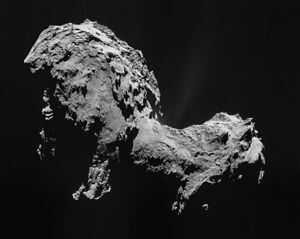 Another rare opportunity is being provided by comet 67P/Churyumov-Gerasimenko. ESA’s Rosetta spacecraft caught up with this comet early in August 2014 and deployed the lander Philae to the surface in November. The orbiter will accompany comet 67P/C-G along its orbit and through its closest approach to the Sun, which takes it between the orbits of Mars and Earth. While this comet is unlikely to suffer the same fate as comet ISON, it will provide an unsurpassed insight into the nature of comets.